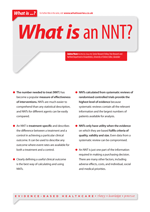 What is an NNT? | Whatis Series...? The number needed to treat (NNT) has become a popular measure of effectiveness of interventions. NNTs are much easier to comprehend than any statistical description, and NNTs for different agents can be easily compared. An NNT is treatment-specific and describes the difference between a treatment and a control in achieving a particular clinical outcome. It can be used to describe any outcome where event rates are available for both a treatment and a control. Clearly defining a useful clinical outcome is the best way of calculating and using NNTs. NNTs calculated from systematic reviews of randomised controlled trials provide the highest level of evidence because systematic reviews contain all the relevant information and the largest numbers of patients available for analysis. NNTs only have utility when the evidence on which they are based fulfils criteria of quality, validity and size. Even data from a systematic review can be compromised. An NNT is just one part of the information required in making a purchasing decision. There are many other factors, including adverse effects, costs, and individual, social and medical priorities.